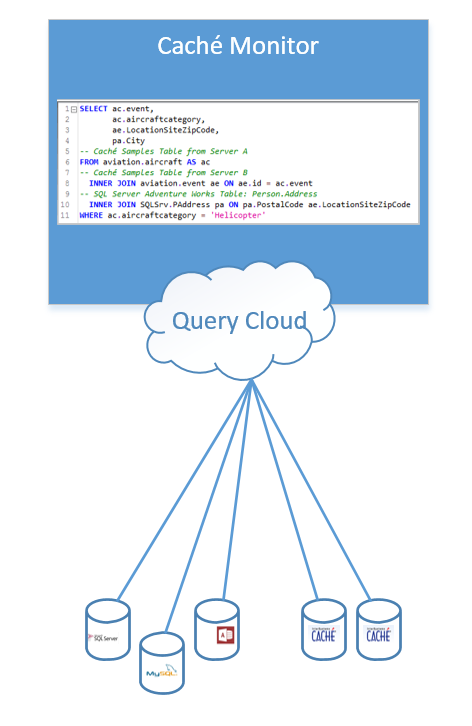 The Query Cloud is like a local virtual database. Within this virtual database you can query and use data from different places, combine with e.g. SQL like joins as if they are in the same Caché Namespace or the same database. You don’t need to move any data into the same place to make some queries. Important: No data is transported to any public cloud system! All queries and data is localy processed from Caché Monitor! With this new feature you can execute SQL Statements across mutiple Caché Servers; Namespace and other Datasources like SQL Server; MS Access and more without any installation on the Server side! All this is done with zero installation on the Server side. Please watch this video to see how it works. This video demonstrates how you can work with CSV files within the Query Cloud and query the data like database tables.